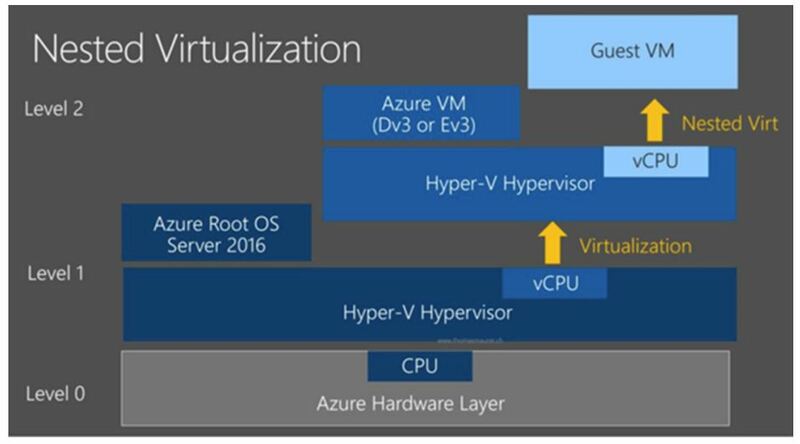 Today Microsoft announced that you can now enable nested virtualisation using the Dv3 and Ev3 VM sizes. Microsoft will continue to expand support to more VM sizes in the coming months. For software and hardware prerequisites, configuration steps and limitations for nested virtualisation please see the document here. In this blog Microsoft discuss a couple of interesting use cases and provide a short video demo for enabling a nested VM. Now not only you can create a Hyper-V container with Docker (see instructions here), but also by running nested virtualisation, you can create a VM inside a VM. Such nested environment provides great flexibility in supporting your needs in various areas such as development, testing, customer training, demo, etc. For example, suppose you have a testing team using Hyper-V hosts on-prem today. They can now easily move their workloads to Azure by using nested VMs as visualised test machines. 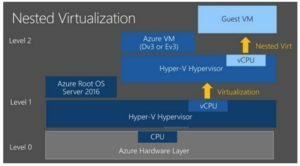 The nested VM hosts will be used to replace physical Hyper-V hosts, individual testing engineer will have full control over the Hyper-V functionality on their own assigned VM Host in Azure.